What happens when you lend your invaluable statuette to a Paris museum and want it back in a hurry? Why, you enlist the help of a society cat-burglar and steal it from the museum! Elementary dear Watson. But which society burglar? Its 1966 and Cary Grant has retired (well, almost) and Stewart Granger is too busy making spaghetti Westerns in Germany. Fear not. In the British Isles the sun never sets on debonair thieves. Lets get Peter O’Toole. He isn’t British (he is Irish) but can disguise himself as an Arab and even has something that Grant did not – intensely blue eyes and a true-blue British accent (Grant’s accent is classified as Mid-Atlantic)! Anupama (1966) – romance Hrishikesh Mukherjee style! Google moves in mysterious ways, its wonders to perform. You ask for information on a new film, and before you know it, you are knee deep in photographs of your favourite B/W onscreen couples! One such search led me to pictures of young Dharam and Sharmila – one of my favourite onscreen pairs. They are both incredibly good looking, excellent actors, and have several great films together. 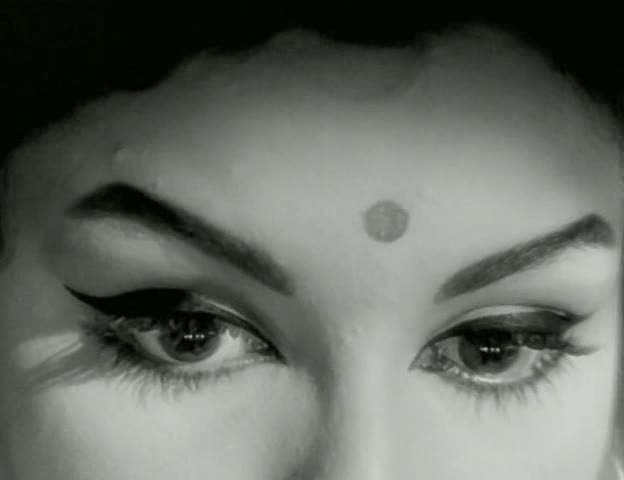 Anupama (The Incomparable One) has long been a favourite of mine, and tops my list of Dharam-Sharmila films. I love well-done romances and they’re seldom as well done as this gentle coming-of-age story of a timid and shy young woman. And no wonder. When Hrishikesh Mukherjee gets together with the likes of Rajinder Singh Bedi, Kaifi Azmi and Hemanta Kumar, one can really look forward to quality cinema. I am a biophysicist by training, a book-worm and movie-addict by inclination. I love old – books, movies, fashions, buildings…. Wish I could travel back in time to see how people lived “once upon a time”. So my reading and movie-watching is pretty skewed towards oldies. I love classic English literature, classic whodunits, period stories, romances, drama – in fact anything masala-y. My tastes in movies and TV series run along similar lines too – it must be fiction, it must be masala and if it stars some good-looking people, it gets bonus points! I grew up in India, watching Bollywood oldies on DoorDarshan, in the days when it was the only channel on TV. So I am particularly fond of 1950s-70s Hindi films. When cable brought Turner Classic Movies to India, I caught the classic Hollywood bug. Since then, I’ve also ‘discovered’ other language films in India, not to mention innumerable TV series and movies from around the world. This blog is my place to discuss what I am watching or reading, the place where I gush over favourites and rant against the ones I dislike. Though I’ll write mostly about old films (1950s-70s Bollywood and 1930s-1950s Hollywood), I also intend to discuss any new films, TV series or books that catch my eye. You are currently browsing the Masala Punch blog archives for March, 2014.